P6 launched hot air balloons in class today to investigate how weight impacts thrust, as part of our World Around Us topic on flight. We also trialled completing our daily tests using iPads. Another fantastic week complete! P.6. designed and manufactured planes for their own airlines. They had to work as a team to design the aircraft they would make, then they split into a marketing team and a manufacturing team, to work within the time restrictions to produce an aircraft. Each airline then had to deliver a presentation and poster to sell their product to the panel. Jake, from P7, was our honorary ‘Lord Sugar’ for the Apprentice style presentations as he had previously presented his airplane to the class. He was our ‘expert’ and we enjoyed looking at his creation which has a motor and propellers! The ‘Shaka Laka Airline’ was crowned our winners as not only did their aircraft impress the judges but Jake commended them for their presentation skills. Well done to all our budding engineers! Another fab Friday in P6! We started the day with some paired problem solving using the skills of logic and reasoning, before moving on to planning and recording news broadcasts about Amelia Earhart and the Wright brothers, in line with our flight topic. On Friday we had a visit from the charity WE. We learnt about lots of different issues in the world, debated on why we thought some are worse than others, had a conscience alley to pick sides in the debate and then thought about how we can change the world. P6 came up with lots of wonderful ways to fundraise in order to improve the world we live in. They were very motivated to go out and make a change! P6 started have moved on in their flight topic and are looking at different types of air transport. They became the ‘Aviation Specialists’ and told the rest of the class all about their chosen form of air transport. They were great at speaking in front of the whole class and learnt lots of new facts. P6 pupils made bird cake today as part of their Fab Friday activities! We planned, created and evaluated our bird feeders and placed them around the school site with the aim of attracting more birds to school ahead of our bird watch in the coming weeks. We used bird seed, rice, porridge oats, sultanas and lots of lard to create some very tasty bird cake! A lot of mess meant a lot of fun!! On Monday afternoon both P6 classes joined together to make pancakes. Despite blowing the trip and nearly setting off the fire alarm, the pancakes (topped with butter, lemon juice, chocolate spread and sugar!) were absolutely delicious! Friday was most definitely fab in P6! We had an amazing morning with John from NI Falconry who brought some special visitors into school. We got to see a range of birds of prey including owls, buzzards, kestrels and falcons. John gave us lots of information about the birds which has made us very excited about starting our new flight topic. It was a great experience, everyone including the teachers, learnt lots of new facts. P6 were very excited to watch an owl in flight when Mrs Hutton got a chance to help out. Even the owl didn’t want to leave the Model, he decided to perch on a noticeboard and stay with us a while! As part of our topic on sound, both Primary 6 classes made electrical circuits to light a lightbulb, sound a buzzer and operate a motor using a switch. We also tested materials and objects to see if they were conductors or insulators. We then had a lot of fun learning about Morse code and making some secret messages to communicate using our circuits and buzzers! P6 spent some time today on the Translink Safety Bus. Pupils watched a video about keeping safe whilst waiting at a bus stop and were also given a presentation about safe travel on public transport. An important message delivered in appropriate surroundings! P6 was noisy today again as we finished practical activities and investigations for our topic on sound! We had a lot of fun with tuning forks, chime bars, homemade telephones and a model of the human ear alongside completing some independent research! During our sound topic we have been looking at the pitch and tone of a range of instruments, with some of our classmates even giving us a music lesson! We then planned our own instruments and then made them using junk. Today we had gave our first performance. I’m sure you will agree our instruments are fab and we sound fantastic! On Monday P6 took part in a session with Young Enterprise called ‘Our World’. We learnt lots of new business vocabulary such as importing, exporting, profit margins and economy. We looked at what makes a business and had a talk from an entrepreneur who had us thinking about our sub conscious and what we can do when we put our minds to it! There was lots of excitement when each group were allocated a country and had to work in their groups, set up a production line and make as much money as possible! We learnt lots and had great fun doing it! P6 used Lego/DUPLO, string and masking tape to make suspension bridges today as part of our Shared Education programme with St. Nicholas' Primary School. Terrific teamwork resulted in brilliant bridges! Well done everyone! P6 was noisy today but expected and justified as we were doing practical activities and investigations for our topic on sound! We had a lot of fun with tuning forks, chime bars, homemade telephones and a model of the human ear to name but a few pieces of apparatus! After break we worked in pairs on a Numeracy challenge to investigate patterns between the sum of consecutive numbers! A real brain workout during which lots of magnificent mental maths was observed! A FAB Friday in P6! 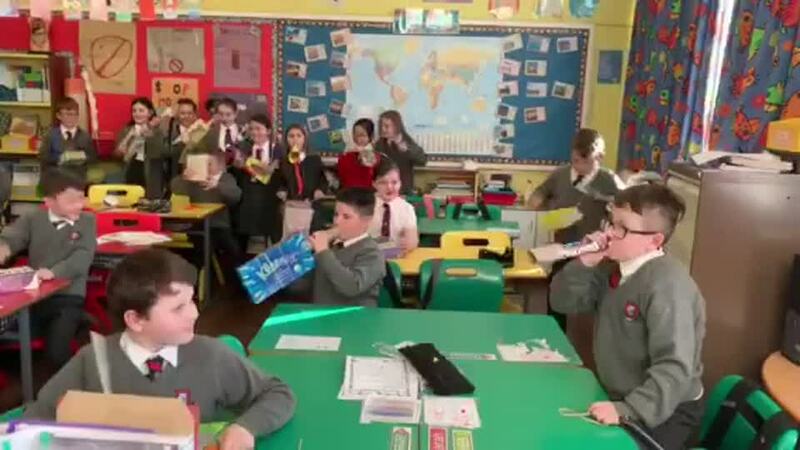 When P6 got back to the Model they made tissue box guitars, as part of their sound topic, to investigate pitch and loudness of stringed instruments! A fun day all round! This week P6 attended workshops run by Action Cancer. Pupils had opportunities to look at the effects that smoking and alcohol can have on their bodies. It was a great session and the facilitator was very impressed with the participation, questioning and prior knowledge the pupils had. P6 are now on route to making good choices for a healthy life! Primary 6 enjoyed a Shared Education trip today to Sunnylands Primary School. A great time was had by all of the pupils who enjoyed making arch bridges with stones and cement and as well as a challenge to build the tallest tower using cocktail sticks and marshmallows! All part of our shared STEM topic of bridges! Mrs Hutton’s P6 attended the Young Enterprise Business Masterclass event, in association with Mid East Antrim Council, at the Town Hall today. They learnt all about supply chains, how business works, the importance of advertising and designed their own packaging for juice. They even got to meet the Mayor. Great fun was had by all and pupils from the Model were complemented on their entrepreneurial skills when they explained their ideas for setting up their own juice company! Watch out Lord Sugar! Special Number Experts in P6! P6 have been learning all about special numbers such as square, cubed and prime. They worked in groups to build cube numbers, played games to become square number/square root experts and even tested their classmates by making square number fortune teller games! They have learnt so much new mathematical vocabulary and really are Special Number Experts!